All-terrain vehicle moto racing game. Drive fast on four-wheeled motorbikes also known as quad bikes. 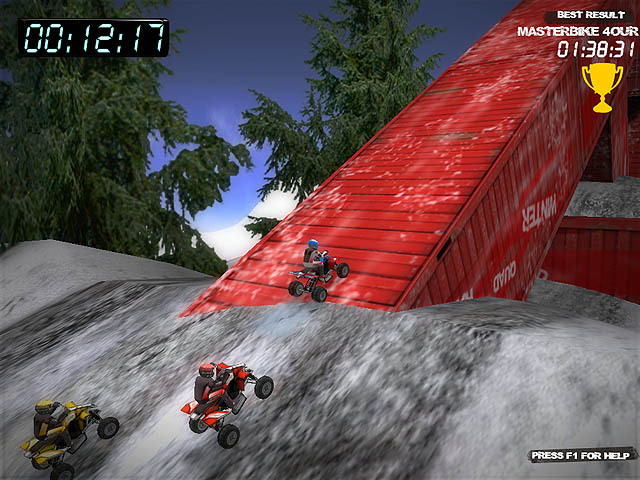 The game takes place on a snow-covered territory with complex routes and features two different modes - Racing Contest and Ghost Race. In the Racing Contest game mode you have to win gold, silver and bronze medals to unlock new levels and quad motorcycles. In the Ghost Race game mode you have to race against your best recorded result to improve it. Try to finish all levels in time and become the most skilled quad bike racer!